Compare the performance in laboratory tests and cost-effectiveness of AMSOIL Signature Series Synthetic Motor Oil to several passenger car/light truck synthetic motor oils widely considered by marketers and con- sumers to be the best available. Laboratory bench testing conducted in accordance with American Society of Testing and Materials (ASTM) procedures examined several important areas of motor oil performance, including resistance to deposit formation, wear protection, high-temperature stability, resistance to acid formation and cold-temperature performance. Bench tests are used widely to differentiate between formulations. According to the ASTM, the Four-Ball Wear Test can be used to determine the relative wear preventive properties of lubricating fluids in sliding contact under the prescribed test conditions. No attempt has been made to correlate this test with balls in rolling contact. The user of this test method should determine to his own satisfaction whether results of this test procedure correlate with field performance or other bench test machines. Although not widely used as an engine oil test, the Four-Ball Wear Test provides a means of comparing relative wear-protection properties of lubricating oils. To better differentiate between lubricants, the severity of the test was increased with higher rpm and temperature (the test standard allows for running the test under modified parameters). The size of the scar as a result of the test indicates the level of wear protection the lubricant provides. Four-Ball Wear Test results indicate significant differences in relative wear protection between oils. The top four performers limited wear scars to under 0.40 mm. 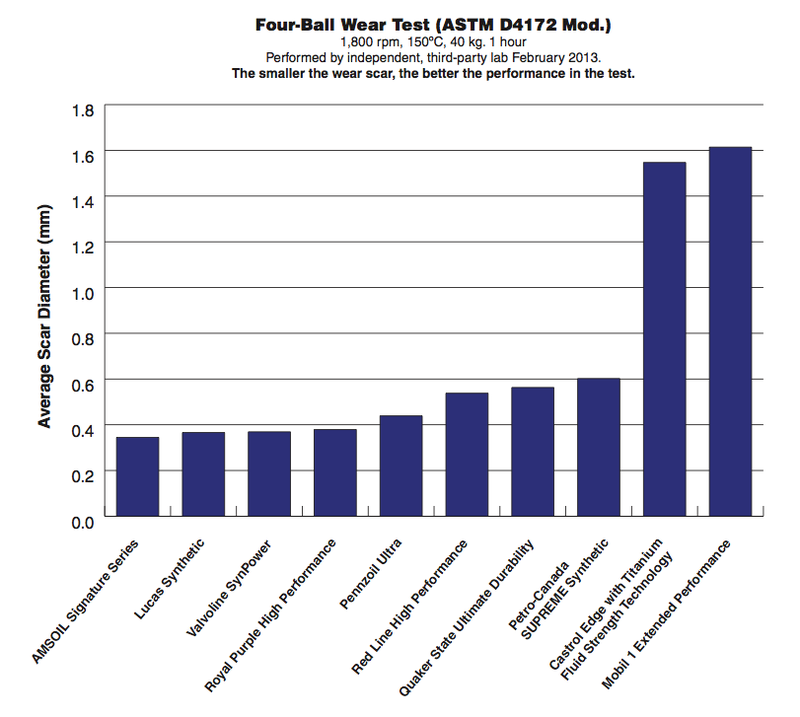 AMSOIL Signature Series Synthetic Motor Oil demonstrated the best wear protection in the Four-Ball Wear Test. Total Base Number (TBN) is the measure of a lubricant’s reserve alkalinity, which aids in the control of acids formed during the combustion process. TBN can also be used as a measure of lubricant degradation in service. Motor oils that have a high TBN and demonstrate good TBN retention are known to effectively reduce the corrosive effects of acids over an extended period. 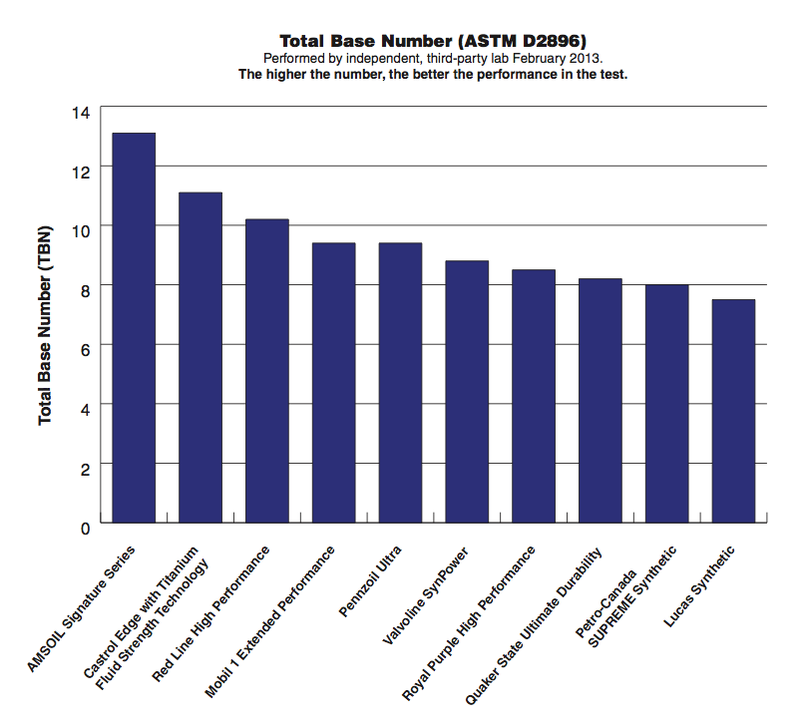 AMSOIL Signature Series Synthetic Motor Oil tested two numbers higher than the nearest competitor. high shear rates. Viscosity of lubricants under these conditions is directly related to low-temperature engine cranking. The test was performed at -30°C (-22°F). Results are reported in centipoise (cP), with lower values reflecting easier cold starts and reduced battery strain. 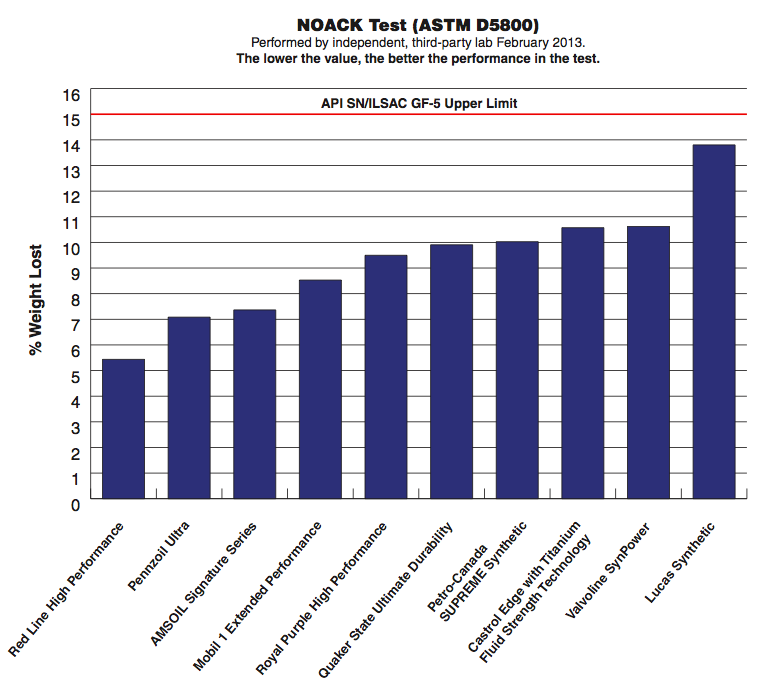 To meet the API SN and ILSAC GF-5 motor oil specifications, a motor oil’s cold crank viscosity must not exceed 6,600 cP. Although synthetic motor oils are known to provide increased low-temperature performance compared to conventional oils, results suggest performance differences between formulations. 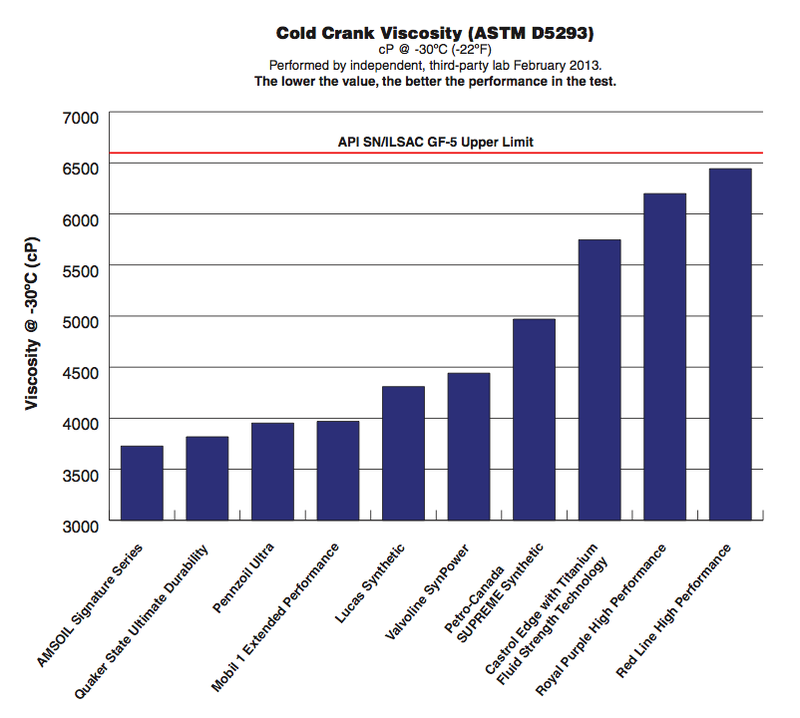 AMSOIL Signature Series Synthetic Motor Oil demonstrated the lowest cold-crank viscosity (3,727 cP). Motor oils can form deposits when exposed to increased heat, reducing efficiency and contributing to poor overall performance. According to the ASTM, the TEOST test method is designed to predict the high temperature deposit forming tendencies of an engine oil. This test method can be used to screen oil samples or as a quality assurance tool. Given the number of vehicles now equipped with direct fuel injection, turbochargers and other performance-enhancing technologies that increase heat, deposit control has taken on increased importance. To meet the API SN Resource Conserving and ILSAC GF-5 motor oil specifications, a 5W-30 motor oil must limit total deposit formation to 30 mg or less. Results demonstrate a range of performance differences between oils. Only Castrol Edge with Titanium Fluid Strength Technology and AMSOIL Signature Series Synthetic Motor Oil limited total deposit weight to 5 mg or less. The NOACK Volatility Test determines the evaporation loss of lubricants in high-temperature service. Accord- ing to the ASTM, “Evaporation may contribute to oil consumption in an engine and can lead to a change in the properties of an oil.” As with the TEOST test, low values in the NOACK Volatility Test are of particular benefit in modern, hot-running engines. In the NOACK test, a candidate oil is exposed to heat and circulating air. Following 60 minutes, the remaining oil volume is weighed and compared to the original weight, with the difference reported as the percentage of weight lost. 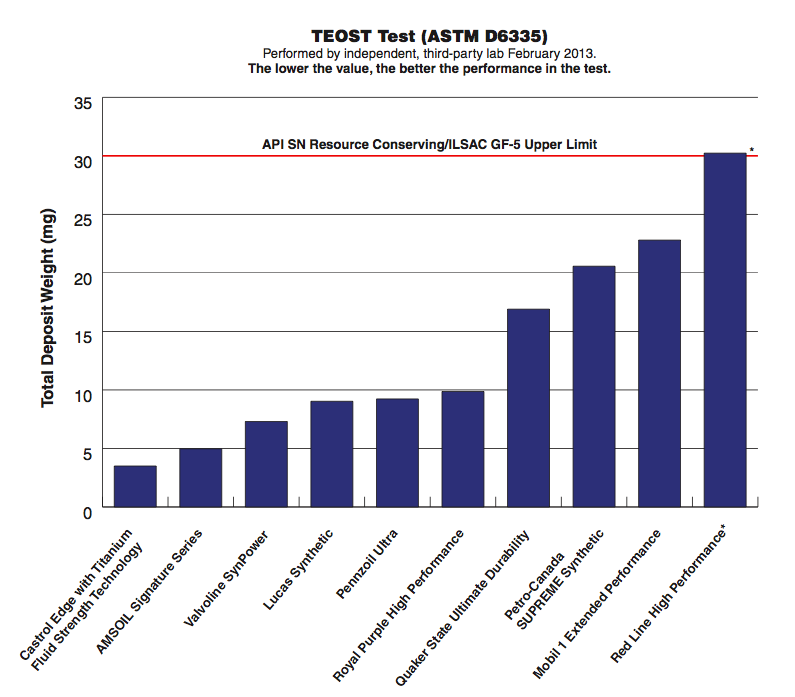 Results must be limited to 15 percent or less to meet the API SN and ILSAC GF-5 specifications. While all oils were below the API SN and ILSAC GF-5 upper limit, results indicate differences in high- temperature volatility. Half of the oils limited the percentage weight lost from volatility to under 10 percent, with AMSOIL Signature Series Synthetic Motor Oil having the third-best result. Although AMSOIL Signature Series Synthetic Motor Oil is recommended for 25,000 miles/one year in normal service, light-duty vehicles accumulate an average of 11,318 miles a year and are generally used in driving conditions that fall under the severe service category. 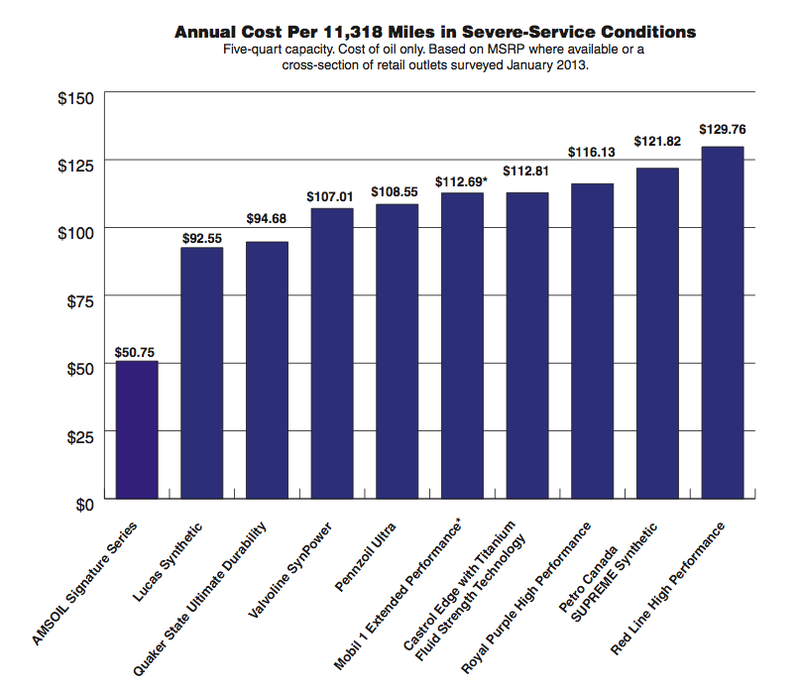 For those reasons, overall annual cost is evaluated at 11,318 miles under severe service driving conditions. Signature Series Synthetic Motor Oil carries a drain interval of up to 15,000 miles/one year, whichever comes first, in severe service. Because the other nine oils do not carry a recommended drain interval, a drain interval of 4,777 miles was used, which represents the average drain interval of motorists as reported in the 2012 National Oil & Lube News Operator’s Survey. Though the retail price per quart of AMSOIL Signature Series Synthetic Motor Oil is initially higher, it provides lower costs compared to the other oils. Overall, Signature Series is the most cost-effective oil. AMSOIL Signature Series Synthetic Motor Oil ranked first in four of the six comparisons. In contrast, while some oils performed well in a few areas, they did not perform as well in others. Different results from one test to another indicate an emphasis in one area of performance does not correspond to increased performance in other areas of testing. It also reveals the difficulty inherent in formulating a high-quality motor oil that performs well in tests designed to assess optimum engine protection and life. As engines continue to evolve and demand more from motor oil, the need for premium lubrication becomes more critical. Industry-standard testing performed by an independent, third-party laboratory reveals AMSOIL Signature Series Synthetic Motor Oil to be the overall top-performing oil in these tests. When considering the savings of time and money available due to its 15,000-mile/one-year drain interval in severe service, Signature Series is also the most economical choice.